Bitcoin Miner Pool Lets your Mine Bitcoins (BTC/Satoshi) Free in large volumes. Have you read about Bitcoin or Ethereum ? Didn’t know how to get it? Bitcoin is the most valuable cryptocurrency today. Until now risking your money to buy bitcoin or understanding complex technology to mine bitcoin were the only solutions to get free bitcoins. With Our Bitcoin Miner When your phone is doing nothing, you have a great chance to make free Bitcoins. 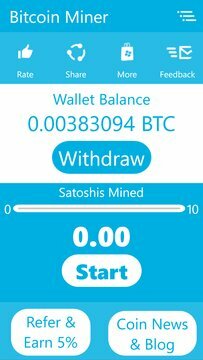 Just launch our App and start mining with a click of button and gain your own free BTC! More the People Join this Bitcoin Mining Pool, the More your chance of earning Bitcoins, Spread the Word and make it popular. We will Be adding More Coins like Ethereum, Ripple, Litecoin, Bitcoin Cash, Dash etc Soon. 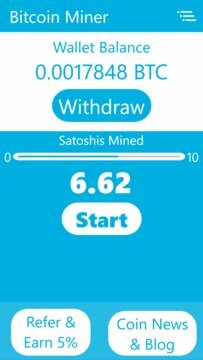 If you want to install and use Bitcoin Miner Pool App, Make sure Bitcoin is legal in your country before downloading or using the App. By using and downloading Bitcoin Miner Pool, it means that you accept our rules and agree that you are solely responsible for any legal troubles you may get into in your area. We are not responsible for similar problems.